Description: UP 4100 drops down Cajon Pass. Description: UP 4100 approaching San Bernardino. Description: UP 4100 at San Bernardino. 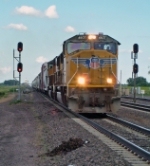 Description: UP Eastbound Doublestack Train at Dalhart, Tx. Description: Meeting a UP detour train at Dennison. A bridge caught fire on UPs Sunset route so BNSF handled a bunch of UP trains for a few days. Title: Close that damn door!! Description: UP's ZYCHO-04(High Priority Intermodal Yard Center Chicago-Houston) shoves into the ramp at Settegast Yd. Description: UP 8450 moves WB with stacks. Description: Behind the VFW, 0833 hours. Description: My first UP train coming off the new overpass at 17th St. Title: UP_4100 is making a crew change at North Little Rock. Note the old auto bridge in the background. Description: Suspect this and the engine tied to it, were the power for UP's AINAR-23.